Place cranberies in a bowl pour brandy over cranberries to soak. Preheat oven to 375 degrees. In a large bowl cream together butter, brown sugar & white sugar until smooth and fluffy. Beat in egg. Combine the flour and baking soda sift into the sugar mixture. Mix until well blended. 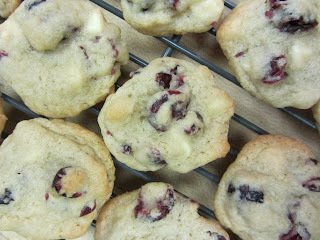 Mix in brandied cranberries and white chocolate chips. Drop by teaspoonful onto cookie sheet. Bake for 8-10 minutes. For best results take out while still doughy. Allow to cool 1 minute on cookie sheet before tansferring to wire rack to cool completely.